Frank Bello of Anthrax performing at The Fillmore in San Francisco, CA. April 23, 2017. Photo Credit: Jared Stossel. Running on only a few hours of sleep, I made my way up to San Francisco to the historic Fillmore Auditorium to see a heavy metal pairing co-headline a show that would be one for the books. Walking past the dark red banners that read ‘SOLD OUT’ across the ticket windows and up the flight of stairs, halfway during Code Orange’s thrilling opening set in front of the increasingly larger-by-the-minute Bay Area crowd, I stepped into a moment in music history. The Bay Area is known for its roots in the thrash metal movement that began in the 80s. We even have a ‘Big Four’, the commonly referred to term that encompases the four bands that are most well-known for bringing thrash metal into the spotlight (Metallica, Anthrax, Slayer, and Megadeth). Any time one of these tours makes its way into the Bay Area, the show is guaranteed to sell out and the venue, whether a small 400-capacity club or a 10,000 seat arena, eminates the smell of beer and sweat. 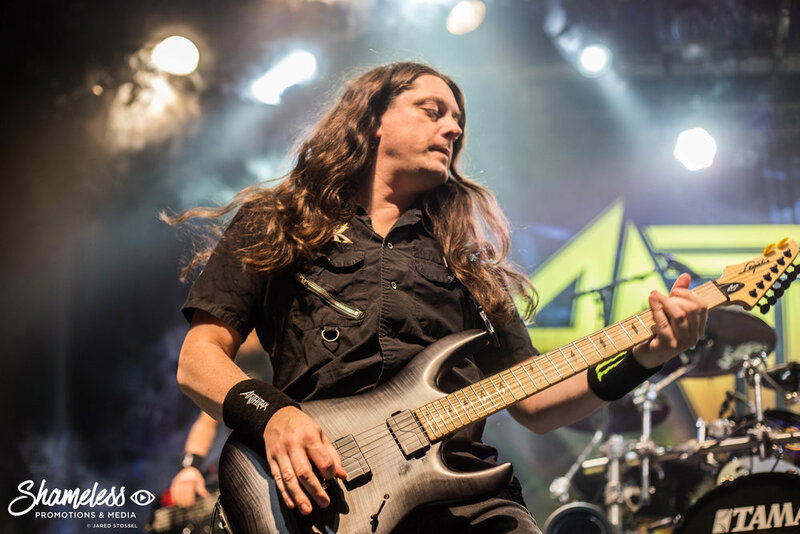 The aptly dubbed ‘Killthrax’ Tour (co-headlined by thrash metal pioneers Anthrax and metalcore icons Killswitch Engage) showcased these traits in the best possible way, leaving their stamp on the Bay Area’s iconic venue with an unforgettable live show. After Code Orange’s set, Ohio metal act The Devil Wears Prada took the stage to perform a number of compelling tracks from their more recent catalogue of albums. I write this having first seen The Devil Wears Prada in 2008, the first time they played the Vans Warped Tour, where their material was comprised only of the straight-to-the-point metalcore of their debut Dear Love: A Beautiful Discord and their promising sophomore effort Plagues. As time has gone on, their music has gotten increasingly darker in lyrical content and style. Their beards and hair have grown out, and they look like a real heavy metal band, not the teenagers that I once saw many years ago on that hot summer day in Mountain View. I’ll admit: as a long time fan, it can be a bit of a bummer knowing that their sets will no longer include material from their older records. But it’s clear that The Devil Wears Prada are now the band that they’ve always wanted to be, and they are damn good at what they do. With material coming mainly from their 2016 release Transit Blues and their 2013 album 8:18 (one of the darkest in their catalogue), they engaged the crowd in a successful manner, showcasing how far they’ve truly come in their ever-growing musical career. Killswitch Engage is one of those bands that I had always liked listening to, yet never fully explored when I first discovered them. Now I can’t wait to see them the next time they come through the area. It’s evident that the Massachusetts metalcore quintet care about putting on one of the best damn shows a crowd has ever seen. They run around the stage with the energy of children that have just downed a liter of soda and a box of candy bars. One of their most prolific members, guitarist Adam Dutkiewicz, proves that he’s not afraid to venture a little further than the stage as he runs to the bar on the other side of the venue (still playing) and proceeds to order a large beer that he has a fan pour down his throat while powering through riff after riff. Killswitch Engage are a treat to watch, and one that defies all expectations of what traditional metalcore should be. Just moments before Anthrax, the most anticipated act of the night, takes the stage, Iron Maiden’s ‘The Number of the Beast’ blares through the PA system in The Fillmore. Every single fan sings along. Actually, they scream along with the track. As the final hits of the song coarse through the sound system, the lights in the venue synchronize with the music. Amidst the blackness, the members of Anthrax make their way onto the stage as the stage is suddenly filled with the perfect amount of illumination and color. Charlie Benante takes his spot behind a massive drum kit that, if you’re in the front row, almost completely covers him. 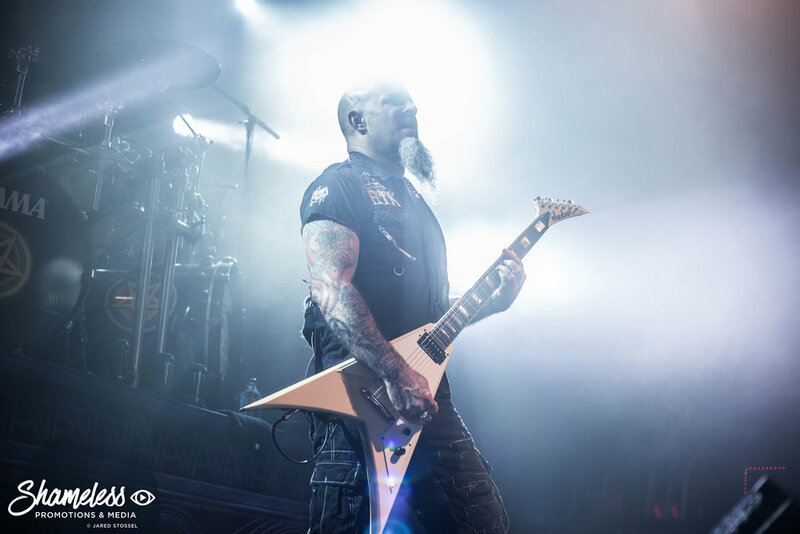 Guitarists Scott Ian and Jonathan Donais run amongst the stage and hammer straight into a onslaught of riffs that move the crowd to their core. Frank Bello runs around the stage in chaotic fashion, strumming the living hell out his bass strings. Right before the vocals are needed, Joey Belladonna arrives, visibly excited and energetic, ready to tackle the massive setlist before them. Crowd surfers are aplenty during an Anthrax show, and the floor might as well just be labelled “mosh pit” on the Live Nation web map when people are buying their tickets for a show of this nature. 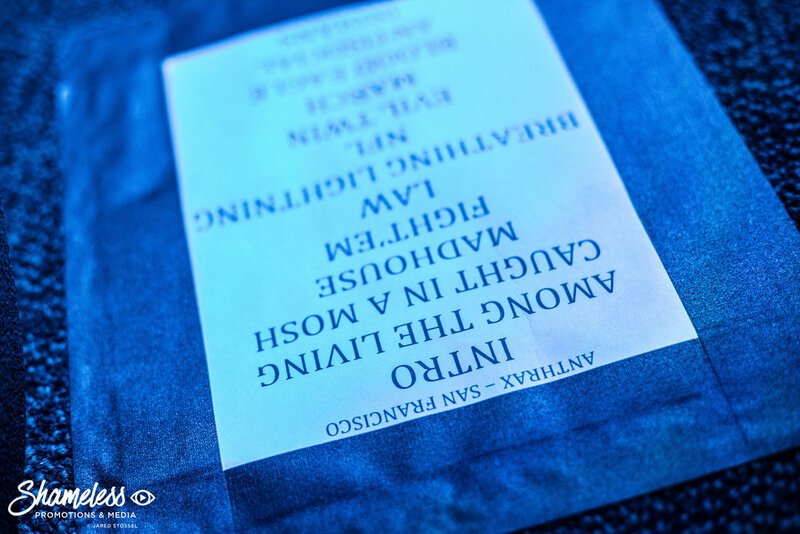 Anthrax’s set list was a mix of tracks that have proven why they are among the Big Four of thrash metal. A number of songs that made up their 1987 studio effort, Among The Living (arguably one of their most successful releases to date) made up the skeleton of their set, kicking off with the title track of the album before heading straight into “Caught In A Mosh”. “Madhouse” from their 1985 sophomore record Spreading the Disease followed suit, with little to no time to slow down before battering their way into “Fight ‘Em ‘Til You Can’t” from 2011’s Worship Music. The band’s set was only twelve songs, yet it’s clear that they could have gone for hours and hours if they had desired (and no venue curfew). 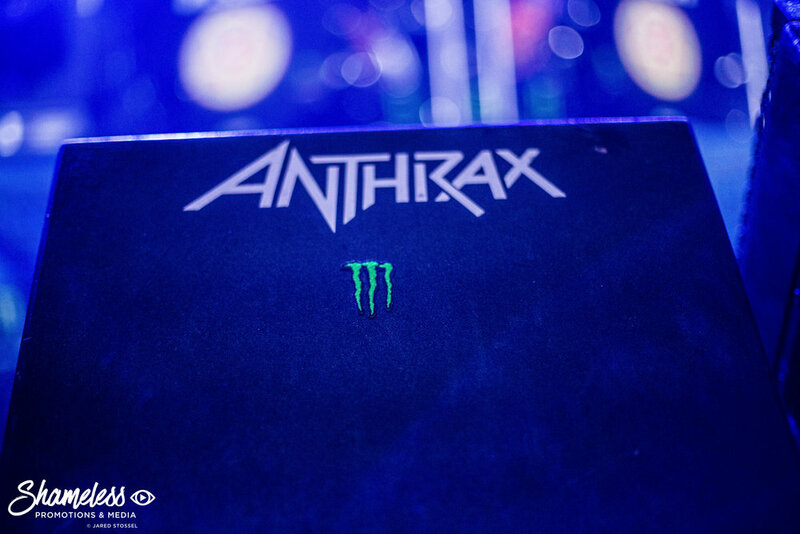 Regardless, Anthrax played host to a tour that was one for the ages, and one that Bay Area metal fans will be talking about for years to come.